In this blog post, we will analyze the characteristics of truncated and censored data and discuss using truncreg and tobit to account for the incomplete data. Fogel et al. (1978) published a dataset on the height of Royal Marines that extends over two centuries. It can be used to determine the mean height of men in Britain for different periods of time. Trussell and Bloom (1979) point out that the sample is truncated due to minimum height restrictions for the recruits. 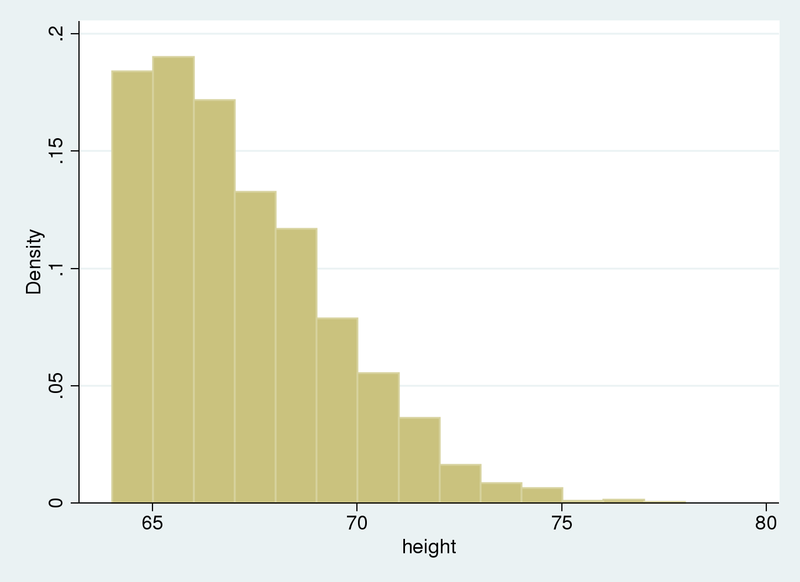 The data are truncated (as opposed to censored) because individuals with heights below the minimum allowed height do not appear in the sample at all. To account for this fact, they fit a truncated distribution to the heights of Royal Marines from the period 1800–1809. We are using an artificial dataset based on the problem described by Trussell and Bloom. We’ll assume that the population data follow a normal distribution with \(\mu=65\) and \(\sigma=3.5\), and that they are left-truncated at 64. We use a histogram to summarize our data. We see there are no data below 64, our truncation point. What happens if we ignore truncation? We can compare the histogram of our sample to the normal distribution that we get if we ignore truncation, and consider these values as estimates of the mean and standard deviation of the population. We see that the Gaussian density estimate, \(f_1\), which ignored truncation, is shifted to the right of the histogram, and the variance seems to be underestimated. We can verify this because we used artificial data that were simulated with an underlying mean of 65 and standard deviation of 3.5 for the nontruncated distribution, as opposed to the estimated mean of 67.2 and standard deviation of 2.3. We can use truncreg to estimate the parameters for the underlying nontruncated distribution; to account for the left-truncation at 64, we use option ll(64). upper =       +inf                     Wald chi2(0)      =          . Log likelihood = -4600.4862                     Prob > chi2       =          . Now, estimates are close to our actual simulated values, \(\mu = 65\), \(\sigma=3.5\). Let’s overlap the truncated density to the data histogram. 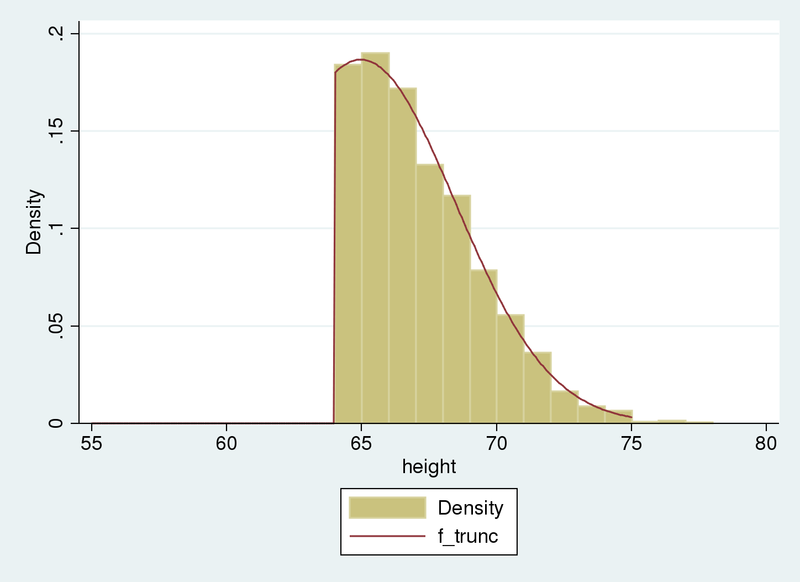 The truncated distribution fits our sample. 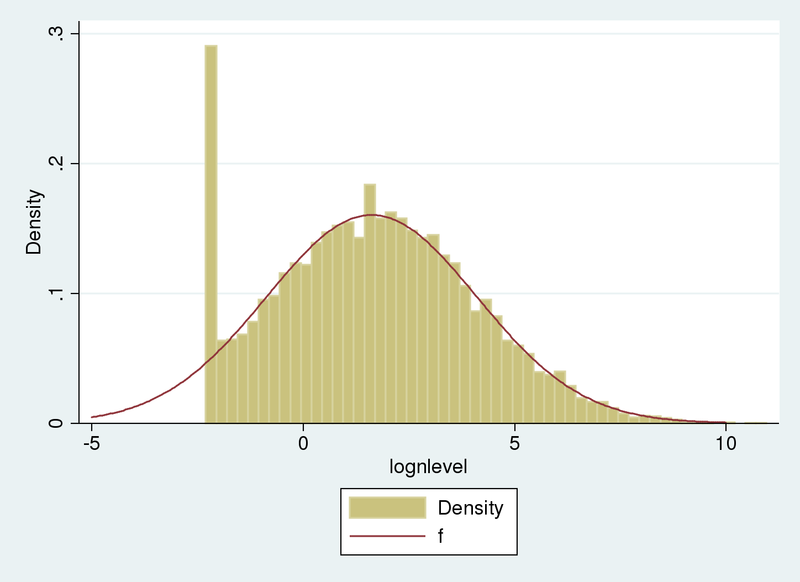 We estimate the population distribution as normal with mean equal to 65 and standard deviation equal to 3.5. Now we consider an example with censored data rather than truncated data to demonstrate the difference between the two. Matt et al. (2004) performed a study to assess contamination with tobacco smoke on surfaces in households of smokers. One measurement of interest was the level of nicotine on furniture surfaces. For each household, area wipe samples were taken from the furniture. However, the measurement instrument could not detect nicotine contamination below a certain limit. The data were censored as opposed to truncated. When the nicotine level fell below the detection limit, the observation was still included in the sample with the nicotine level recorded as being equal to that limit. I have created an artificial dataset loosely inspired by the problem in this study. The log of nicotine contamination levels are assumed to be normal. Here, lognlevel contains log nicotine levels. The parameters used for simulating the log nicotine levels for uncensored data are \(\mu=\ln(5)\) and \(\sigma=2.5\), and the data have been left-censored at 0.1. We start by drawing a histogram. 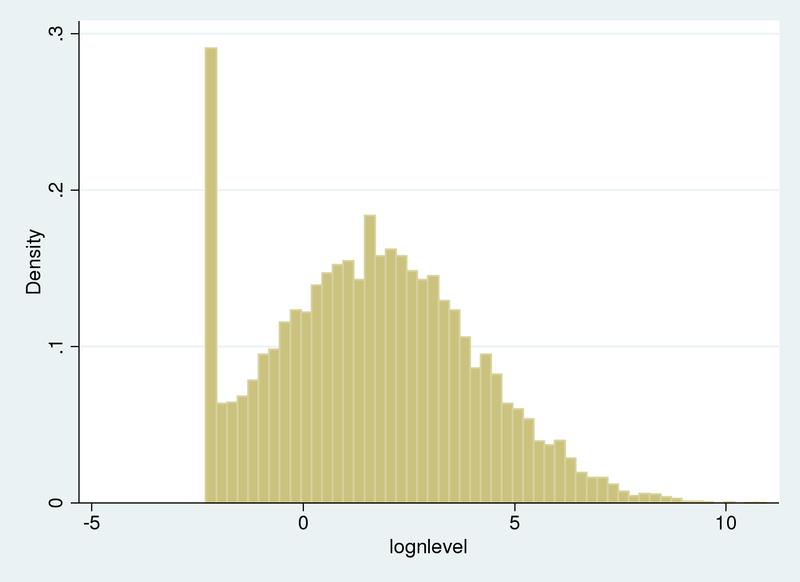 There is a spike on the left of the histogram because values below the limit of detection (LOD) are recorded as being equal to the LOD. Computing the raw mean and standard deviation for the sample will not provide appropriate estimates for the underlying uncensored Gaussian distribution. Mean and standard deviation are estimated as 1.68 and 2.4 respectively, where the actual parameters are ln(5) =1.61 and 2.5. We estimate the mean and standard deviation of the distribution and account for the left-censoring by using tobit with the ll option. (If censoring limits varied among observations, we could use intreg instead). Prob > chi2       =          . The underlying uncensored distribution is estimated as normal with mean 1.62 and standard deviation 2.49. The underlying uncensored distribution matches the regular part of the histogram. The tail on the left compensates the spike at the censoring point. Censoring and truncation are two distinct phenomena that happen when sampling data. The underlying population parameters for a truncated Gaussian sample can be estimated with truncreg. The underlying population parameters for a censored Gaussian sample can be estimated with intreg or tobit. We've discussed the concepts of censoring and truncation, and shown examples to illustrate those concepts. The discussion above is based on the Gaussian model, but the main concepts extend to any distribution. The examples above fit regression models without covariates, so we can better visualize the shape of the censored and truncated distributions. However, these concepts are easily extended to a regression framework with covariates where the expected value of a particular observation is a function of the covariates. I have discussed the use of truncreg and tobit for censored and truncated data. However, those commands can also be applied to data that are not truncated or censored but that are sampled from a population with certain specific distributions. Fogel, R. W., S. L. Engerman, J. Trussell, R. Floud, C. L. Pope and L. T. Wimmer. 1978. The economics of mortality in North America, 1650–1910: A description of a research project. Historical Methods 11: 75–108. Matt, G. E., P. J. E. Quintana, M. F. Hovell, J. T. Bernert, S. Song, N. Novianti, T. Juarez, J. Floro, C. Gehrman, M. Garcia, S. Larson. 2004. Households contaminated by environmental tobacco smoke: sources of infant exposures. Tobacco Control 13: 27–29. Trussell, J. and D. E. Bloom. 1979. A model distribution of height or weight at a given age. Human Biology 51: 523–536.